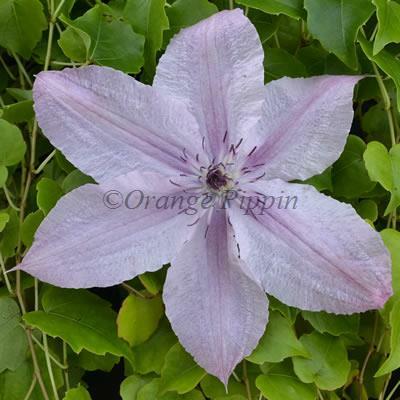 Clematis 'Hagley Hybrid' is a reliable variety, good for the beginner to start out with, but still rewarding for the most experienced of gardeners. Shell-pink flowers are very freely produced during July and August. This slow growing, non-evergreen climber, ideal for the small garden and is best planted out of direct sunlight, grown against a trellis, wall or planted in a container on the patio trained up bamboo canes or an obelisk. Raised by the late Percy Picton at Hagley Court, Nr. Hereford. First an apology to any residents of Hagley, Worcestershire who may be reading this. The Hagley in question is Hagley Court, near Hereford. When the Mr Percy W. Picton left Gravetye Manor (the seat of William Robinson) he brought with him seedlings of Clematis which he had raised in association with Ernest Markham, the head gardener at Gravetye. When in fullness of time, these seedlings flowered, on seeing one open in a stunning shell-pink, he knew at once he had a winner and called it Clematis 'Hagley Hybrid'.